Here’s another motion blur photograph, but considerably more subtle than yesterday’s. 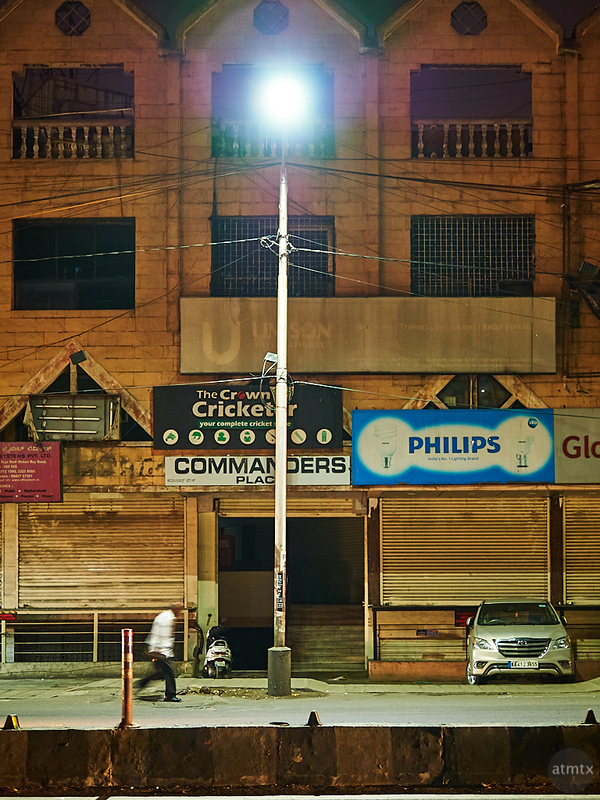 I actually shot this on the same street during the same nighttime photowalk near the ITC Gardenia. And though the street was busy, I just happen to catch it during a lull. Without that tidbit of information, you’ll probably get an entirely different impression. Perhaps one of a late night scene in a deserted part if town. Without any building lights and a single street light, it does have a lonely feel. Shooting off centered compositions are not unusual for me, but I like how the street light is in the center. The walking person and the car seem to balance each other. Though the building is not shot perfectly symmetrical, I think there’s still a nice sense of balance. I post-processed, like I do on almost all my photographs, but I did some extra geometric perspective corrections. That’s how I got all the lines straight and a perfectly upright building. It makes for a precisely framed image that gives a bit of formality to an urban landscape.